Anyone can work at home as freelancer and make money online. You can find jobs, complete them, and get paid from home. In today’s post, let’s see how you can use the web to make money with your skills and time. In fact, I’ll show you how you can use a site called freelancer.com. It can help you make money by doing freelance jobs or by referring your friends as an affiliate. Recall that a freelance worker is someone who is working for one or different companies without a specific boss; You work with freedom, you are a freelancer. You can make money with part time jobs, hourly jobs and fixed projects on short terms and long terms projects. Your employers set rules for the time of contract or you set your own rules based on services you have to sell. It’s a win-win. It saves time to employers who want to get jobs done and increase revenue. It makes money to workers who want to work from home online. Formerly GetAFreelancer (GAF), Freelancer.com is the largest outsourcing marketplace where employers can employ employees to complete freelance tasks. It is where freelancers can browse to find online jobs to make money working at home. By outsourcing jobs, it means that opportunities are borderless. Whatever the country where the employer is located and where the employee lives, the freelance project is possible online. By freelance tasks, it means that you are free to work for anyone. You have no specific boss; you sell your services to competitors, high scaled companies, small business or individual. Freelancer.com is simple for both employers and employees. you select the freelancer to complete the project among the ones who bid. you pay when your project is completed. You can’t do everyday and scale at the time as business owner. Outsourcing tasks is often the best choice. You can start an account for free as employer today and post your first project for free. It is also simple for freelancers. You bid on a project. (competition is tough). you are selected and complete the project. Create your freelancer account today and start making money. What are Freelancer.com payment methods and terms? Payment methods from freelancer dot com are really flexible. You can receive your payment or pay through PayPal, Skrill, ACH, Wire Transfer and Payoneer. The minimum payout is $30 and payment is made twice a week. You can get paid on Monday and/or on Thursday each week for your completed work at home jobs. How to make huge money online with freelancer.com? If freelancer.com is the most popular freelance marketplace, it is for a reason. You can make money different ways with freelancer.com; not simply completing jobs. Then, Freelancer.com buy companies and forums with large users base and make them integrated with it such as warrior forum, vWorker freelance marketplace, etc… Let’s see how you can make huge money online with freelancer.com. Freelancing is the main way to make money on the website and it is unlimited. With just an internet connection, a computer and your skills, make huge money completing freelance jobs. You can bid for part time jobs or long-term project. So, the revenue is limitless as a simple logo design or social business page project can pay $500. As there is no limit, you can make huge money simply with the affiliate program. I made $250 from a single project from an employer ($69.30 were cancelled then). You can create your account today and start referring your friends and make money. The freelancer virtual marketplace allows you to sell your files on the site. You present your files to the large audience of freelancer.com and get people to buy them. You can also sell your services on freelancer.com using the micro job marketplace; it is called freelancer services. You can monetize, starting from $5, with every skill you have. Whatever you can do, sell it and set your own rules, make money with it. I wrote a more detailed article about micro jobs. But I will add some example to show you how you can make money using freelancer.com micro jobs marketplace. You can post 25 quality comments on someone’s website for $5. You can promote an article to your 50K pinterest followers for $30. You can help someone optimize her WP theme for search engine with rich snippets and on page SEO techniques for $50. Is freelancer.com legit or scam? It is always wise to check out if a website is paying or if it is a scam before joining. Till now, freelancer.com is a legitimate online work at home jobs website. You’ve seen payment proof in that post already. Here’s another one. You can make money using any or all of these methods with a single account and all your earning will go to a single account balance. You can then take out your money easily through PayPal, Skrill or MoneyBookers and Payoneer by reaching the $30 minimum payment threshold easier. Take the time to share this post with your friends if you liked it! Nice post! Freelanceer is giving opportunity to all those who have skills. By selling their skills they can easily make some money. The Freelancer is creating great employment. Also, for those who are busy in their work can hire others for reasonable price to do their work. I am also trying Freelancer and earned some good cash out of it! Hello Swaraj, thanks! Freelancer is great; i am a freelancer and affiliates at freelancer.com since 2012 and i am still satisfied! I found your post quite valuable as I already knew about freelancer.com for freelance working and making good money. Still, I was unaware of some of the best practices that you have mentioned in your post to make most out of that amazing platform. It is quite complex to get work on Freelancer for new users, so as you mentioned in 4th section, introducing self with such project headlines can do wonderful in getting work on freelancer. I had not tries freelancer this way and I am sure this practice will definitely work. Further as you mentioned about affiliate program, Freelancer’s affiliate program works great for established and large blogs and sites having thousands of active users. Anyways, Thanks a lot for sharing the tips through post. Glad that you found interesting things, Sandeep! Thanks to you for reading. I agree with your comment but i just want to add that freelance affiliate program works for anyone. I made more than $150 from affiliate programs by posting an article about freelancer on a previous website getting less than 40 visitors a day. By writing a good post on a keyword with low competition and less than 400 searches a month; i thought that my readers will be real and interested. I learned that the most important point is to shout out the word, even if you don’t think someone will listen to it! Then, we can go strategies when we start knowing our audience. Freelancer.com is popular in bringing together freelancers and employers. It has come a long way and it seems to be expanding its offers. The affiliate program of Freelancer.com is an additional earning source I am just learning of. I guess earning recurring affiliate income from this website would be worth it! Yes, the issue of this website being legit or not should be raised. So far, I have not have reason to doubt the authenticity. The system is properly set up but newbies should be ready to face very stiff competition. You’re right! Getting jobs from freelancer is sometimes similar to the real world. You have to submit a convincing bid to let employer knows that you are the right one! Thanks, Sunday! Freelancing has been one of the suggested ways to earn money online. As what is said above, you can earn money in freelancing with part time jobs, hourly jobs or fixed tasks on either short or long term projects. Freelancer.com is familiar to me, since this website is prominent in today’s online world. As far as I know, Freelancer.com has been the largest outsourcing marketplace where companies or employers can hire and pay employees to do freelance jobs. You’ve done a great and informative review about Freelancer.com, and I’m pretty sure that this article of yours would be a big help, especially for those who want to get familiarized with this website. Thanks Ann! Freelancer.com is a website that worth a try when making money online! I have know freelancer for quite some time now but never thought of the affiliate side of it. It’s also interested that once is able to sell his own stuff on it. I’m going to check that out right away. You’re welcome, Enstine Muki! And thanks for reading. The affiliate side of freelancer worth a try! You can use your blog to to teach people how to use it as you earn from 90 first days of referred freelancer or employer. I use freelancer to make money online but there is a lot of competition though. Yes, Eddy! There is a lot of competition. That help both employers and employees because everyone are trying to give their best out to get a good review for future jobs! Pierre, freelancing rocks as does your breakdown. Thanks! Thank you, Ryan! I am glad! What do you guys say about Odesk? is it better than freelancer.com? btw I have tried Fiverr but there is huge competition there to survive. Hello, my friend! I am a member of both system. I just prefer freelancer.com but i can say that it is different. I prefer freelancer for lower fees, well designed profile that keeps employers looking at your profile and large audience. Odesk is another popular outsourcing jobs marketplace you can check out; they have a low minimum payout of $1 but has $1 fee by withdrawal; then, unlike freelancer, they have a separate affiliate program on cj where you must wait a 45 days before getting paid! There are still competition on these freelance marketplace as well. But there, you don’t wait to be seen; you present your skills directly by bidding on listing! Hello! Very interesting read! I like hearing about new things and trying them out, life is all about expanding and gaining knowledge right?! My father and I currently own a business where we work one on one with realtors or home owners. We work on interiors and exteriors of houses. We make sure it looks beautiful for sale or just for the satisfaction of the home owner. We are currently swamped with work and dislike having to tell our clients that we are to busy at the moment to see new jobs. I want to make new connections and prove that though we can not do a job for them, we can find someone who will! So their search and anxiety can cease! I am 23 yrs old and just want to learn! I want to make the best out of life and help where I can! Could freelancer.com help in me finding awesome people to trust with our very awesome clients?! Hello David! Freelancer.com will help to build trust around your services; but as you provide a service you can not complete online, you can only work for local clients. I have seen people building trust with home design but my virtually design home using graphic and 3D software. It would be easier with that kind of task. 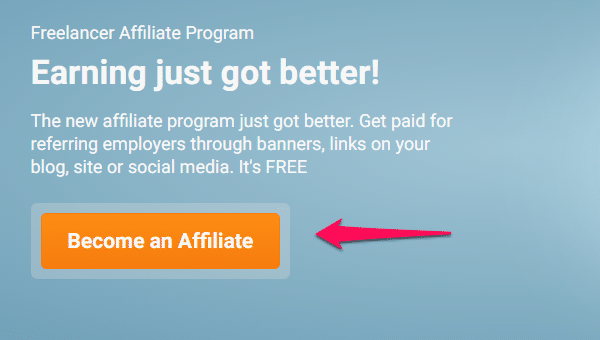 I have had of Freelancer before but I didn’t know they had an affiliate program. I used to be with Donanza who was like Freelancer but they went out of business. I might check out Freelancer’s affiliate program. Thanks for sharing this with us. Hello Maketta! I know about this program for two years; but i enjoy adding it there as even existing freelancer.com member was not aware of the program. I knew about Donanza as well but never use it. Thanks for reading! Yes when it comes to how to make money as freelancer, you should consider developing basic skills that will make you more desirable to online marketers. For example, most writing jobs online consist of keyword optimization. Keyword optimization is a relatively simple process of adding a phrase or multiple phrases to a body of text at a certain density. If you were writing a 500 word article about dog training and the client gave you the keyword phrase “border collie food bowl aggression” with a density of 3%, you’d need to include that phrase in the article three times. Freelance writing is the most popular kind of freelance jobs available online! If you can conduct researches and write well, you can make a lot of money! You can make more money with freelance design but it requires more skills! Thanks for commenting, Omar! I couldn’t agree more! I’ve always given the advice that it’s a good idea to offer services in order to get the money rolling in first if someone can’t afford the start up costs of starting an online business. I did everything in my business myself in the early days, however, it didn’t take me long to start enjoying the benefits of outsourcing menial tasks that I could delegate to someone more skilled than myself. Hi Carol! I am glad that you found the article interesting! It is always a good idea! I did not know how to make huge money like that when i started; i used PTC to make money to buy hosting that pay month to month and here i am! if someone start selling services where he get paid huge money, it is guaranteed! This platform is a global outsourcing marketplace and it was founded in 2009. Those people who have skills in writing, designing or anything could find jobs here and apply. It’s easy to earn money if you have a complete profile that suits the position that you are applying. However, nowadays, freelancers are strict and very picky. Newbies will have a difficult start and earning money will not be easy, but do not cease to try your best and improve/update your profile. Hi, Metz! It is a useful tip tat you gave! Try, learn and improve! Thanks for commenting; thanks to kingged who sent interesting people who take time to read and comment. Freelancer.com is one of the most reliable resource to get freelance online work and earn money from the comfort of your home. Initially it takes time to grab a project but once you get the one and do it on time then you get reputation of a good professional. Your CV has a completed task and then you can easily impress your employer to get more work. Thanks for sharing this wonderful post which itself is a complete review on this resource. Hello, Mi Muba! You’re welcome and thanks to you who left this meaningful comment there! It is the freelance marketplace i trust the most! I have allready created account at freelancer.com, but have not started to do anything. But this post convinced me, that it is real opportunity to earn some money. You’re welcome Rolands! I wish you success in your freelance career! Hi, what do you think of http://www.hire-freelancers.com, the only one free online freelance site for freelancers and buyers! Freelancers earn more without paying any commissions or fee. The site does not charge the contractor or the company after completion of the project. I have a question about the 90% you get off the commission. So if you refer someone (an employer) who hires someone for a $100 job and freelancer.com takes 10% (just an example), that means the commission would be 10%. So if you receive 90% of that commission, you would earn $9 off that job plus the $1 for the employer signing up? That would be $10 total, correct? Hello Tom! Thanks for reading! Your answer is almost correct. You get $9 off that job. But there’s no $1 signup with freelancer dot com till now. I made a search just now and rules did not change. The advantage is that you will earn from the next 90 days from referrer earnings or expenses. In fact, i got $4.50 from a referral recently for a $100 theme development job. I earned also from bonuses he got; this can increase your earning when employer reward successful freelancer with bonuses. hey will you please give me information. can I earn through freelancer I am very good in drawing…?….! What kind of drawing? You can illustrate on Inkscape or creating logos? You can go to illustration category and apply for jobs. Helped a lot! Thank you for your help. I’ll be joining soon and make sure I use your link. ¿how can I know if any of them hired anyone? When / how will I know if I received a payment? Is 1 week too soon to expect paymentS? The new design does not include the referral stats yet. But you’ll see your revenue instantly as they hire someone or get hired. The profit is now 100% fees from projects. I hope they’ll add the button back soon. It was under financials. It is not about how much referrals. It is about how much your referrals earn or spend. Freelancer.com take 5% fees from all projects. During the first 100 days of these referrals membership, you get 5% of all of their expenses or earning. As you see it in the screenshot, reports were detailed. You could even look at your referral profiles even if they do not get jobs. Ever Since the day I made a move to become a Freelacer at Fiverr, my Life changed. Little did I know there was another great Site called Freelancer.com which will soon become a channel of income for me. Fiverr is a mico job marketplace. If it changes your life doing micro jobs, you could have higher impact with a standard outsourcing place. I have a post about online micro jobs. It changed my life too! It helped to find enough money to pay for my hosting till my website pays for itself! i am a data entry operator on freelancer but i am unable to get big work in this category because for big work i required a team because every freelancer employee wanted their work to be completed on time and big works have lot of works and it is impossible for a single person to complete it on time , freelancer is a genuine website and i received payment through payoneer. I have been working on freelancer as a writer/copywriter and in my 1 year experience i have moved from earning $20 per day to $50 per day. one should always bid on jobs that he or she is familiar with and as you build your profile , you will become a preferred freelancer in your skill. My goal is to reach $100 per day before the end of the year. I have freelanced for 3 years, but with Upwork. It’s been an awesome run. Do you know if the writing opportunities are as good as at Upwork? Thanks. It’s hard to say. I have seen great job offers on both systems. However, you reputation plays a big role in the gigs that you get. Building a reputation on freelancer is a must to get high paying jobs. You can try both systems at the same time.